Anti Tivo-borking by stevegarfield, uploaded from flickr. 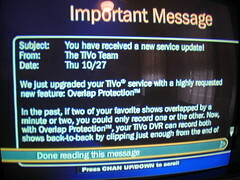 We just upgraded your TiVo service with a highly reqqested new feature: Overlap Protection (TM). In the past, if two of your favorite shows overlapped by a minute or two, you could only record one or the other. New, with Overlap Protection, your TiVo DVR can record both shows back-to-back by clipping just enough from the end of one show. Link: Steve Garfield's Off On A Tangent: Daily weblog on pop culture and technology..
Link: NBC returning TV shows to regular start/end times | PVRblog. After a couple years of NBC tweaking start and end show times to push their advertising dollars (and tweak PVR owners in the process), it seems they're abandoning the practice of starting early and ending late. This fall line-up preview of NBC's shows. Link: Lost Remote: Suffering from TiVo discrimination. Suffering from TiVo discrimination I'm a little miffed. I TiVo'd Thursday's episode of The Apprentice, but I saw a clip on TV today that revealed who got the boot. Arrgh! Call it TiVo discrimination. Those pesky entertainment shows and even some news sites spoil our recordings because they assume everyone watches TV shows live. Wrong! We TiVo elite watch TV on our own schedules, even American Idol. I predict a growing backlash as more Americans time-delay their favorite shows. Here we go again. First it was NBC, and now ABC is tweaking the start and end times of some its biggest shows. Lost is ending between 9:01 and 9:03pm, which throws many DVRs into confusion with the popular 9pm show, The West Wing. ABC's Jeff Bader claims the 9:03pm ending was necessary because that week's episode of Alias -- which follows Lost -- ran short. By design, I'm sure. Catching unsuspecting viewers in a time warp. For the networks, the advantages of time banditry extend beyond the psychology of subordination. By carrying ''Desperate Housewives" for 61 minutes Sunday nights, ABC can attach more higher money-generating ads to that show than the lower rated series that follows, ''Boston Legal." We've got to fight the money hungry TV networks and take back control of our TV's. TV networks lengthening shows by one to two minutes, in order to screw up viewers' TiVo recordings. Television networks are lending new meaning to time-shifting: TV shows don't necessarily start or end right on the hour or half-hour anymore, screwing up some viewers' video recordings.